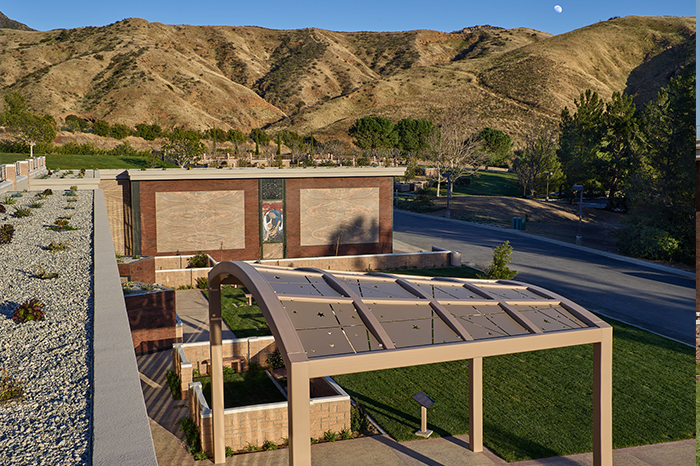 The distinct architecture of The Courts of Abraham provides comfort, peace and thought-provoking artistry to all who visit Mount Sinai Simi Valley. 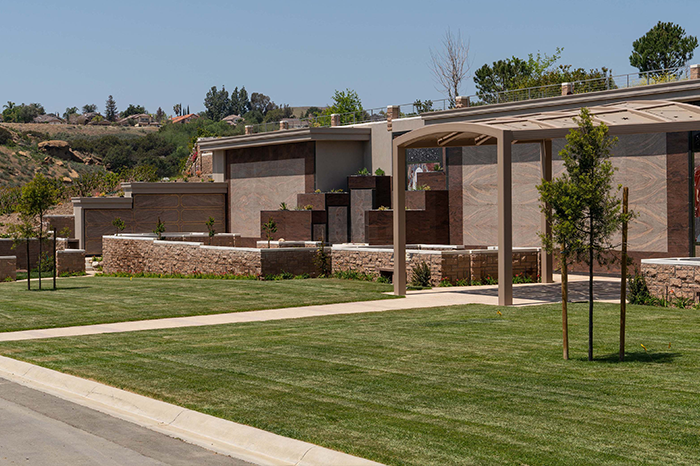 Dedicated in 2017, this beautiful section offers families various choices for interment including a traditional grassy lawn, family gardens, and elegant wall crypts – all accented by succulent gardens and dramatic granite mosaics which depict well known scenes from Abraham and Sarah's lives. . 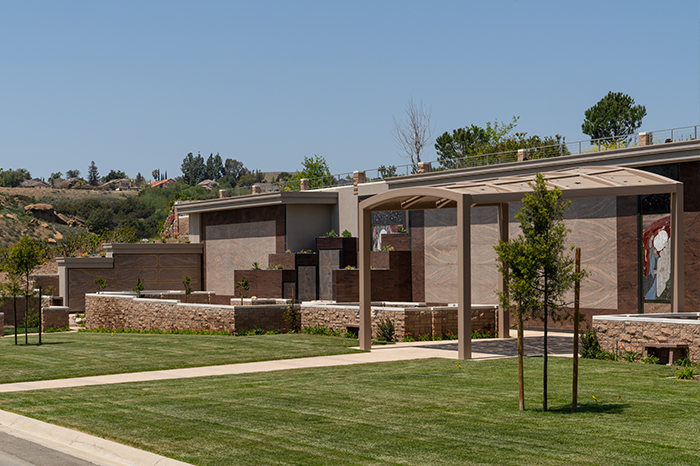 Approaching The Courts of Abraham, one may stroll through Mandel Plaza and pass under its distinctive steel and aluminum shade structure which represent Abraham’s Tent from which Abraham and Sarah offered hospitality to all. 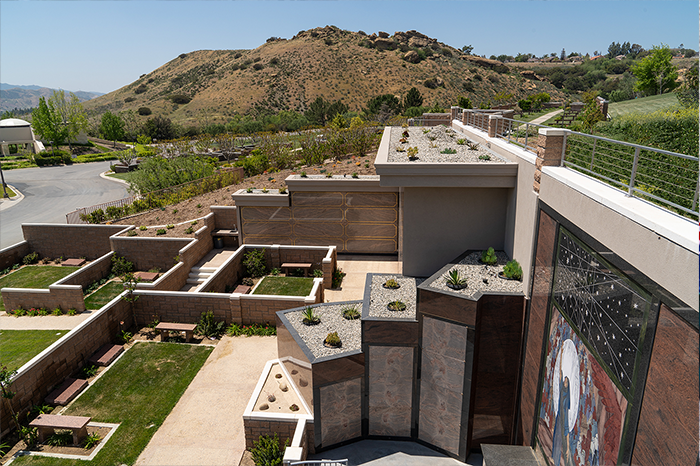 Scroll through the photos below to view the grandeur of The Courts of Abraham, then call (800) 600-0076 to speak to an Advance Planning Representative to learn more about obtaining property in this much sought-after location. 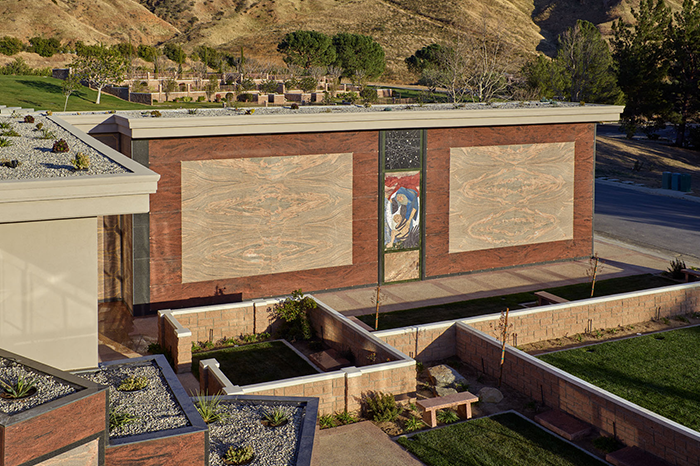 Accenting the walls crypts in The Courts of Abraham are four intricate granite murals and a distinctive steel and aluminum shade structure, all designed by Laurie Gross Studios - renowned artist Laurie Gross in collaboration with her son, Elisha Schaefer. 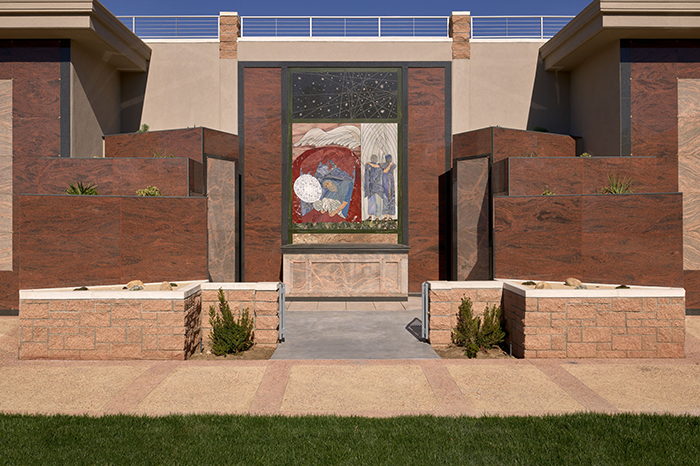 The large cut granite mosaics, comprised of from hand-selected pieces of granite slabs chosen for their very special textures and variations of color, illustrate four well-known stories from Abraham and Sarah's lives as described in the Torah. 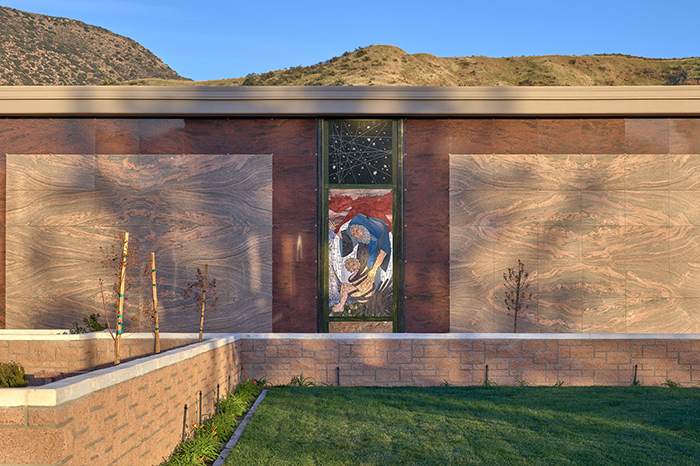 As a continual visual thread to connect the four murals, each incorporates and elliptical shape which represents an egg - the symbol of a new life, and in framed between top and bottom sections representing the starry sky and and grains of sand. 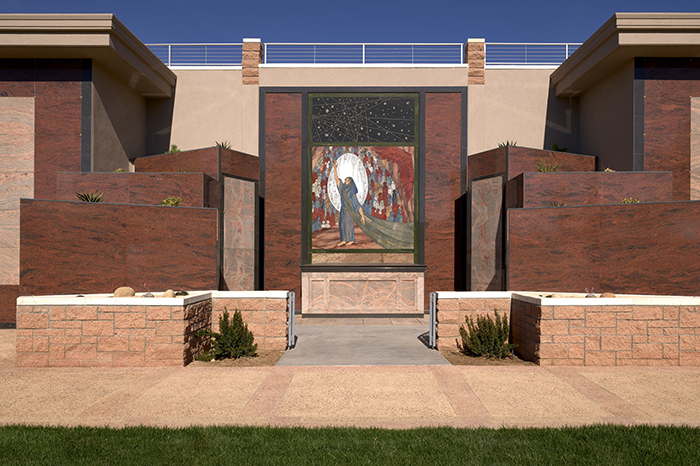 The Promise features Abraham as the central figure, reaching up to skies to represent his relationship with God who has promised a great nation filled with descendants. Multitudes of Abraham's future generations are visible on either side of him. 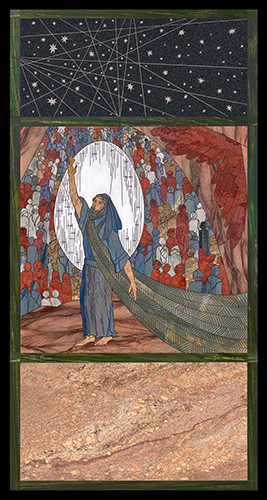 The Open Tent highlights Abraham and Sarah welcoming three messengers into their home. Sarah is holding up the tent with one hand while Abraham greets the guests with his hand. Machpelah depicts Abraham lovingly holding Sarah's body as he prepares for her for burial at Machpelah with an angel hovering. 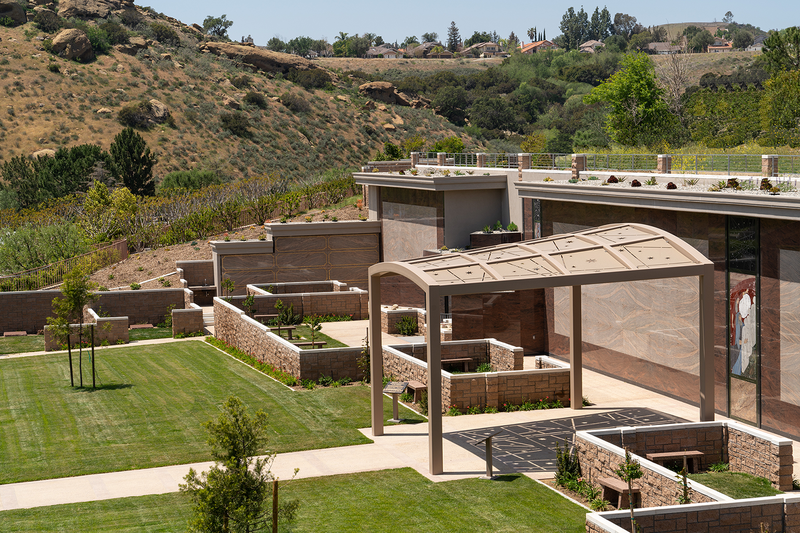 Above the cave opening is another hovering wing which represents the presence of Schehina. To the right are the two brothers, Isaac and Ishmael, as they came together to bury their father Abraham. 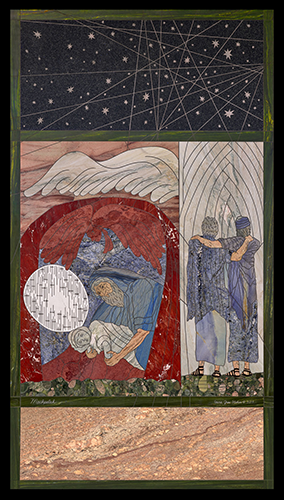 Akedah depicts Abraham following God’s instructions to sacrifice Isaac. In the original story, Sarah is not present, however in this mural, Sarah is present as the angel, stopping Abraham from proceeding. 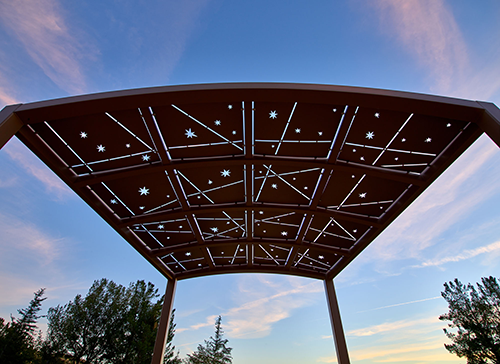 The late afternoon sky creates a colorful background to the cutouts of the shade structure located in Mandel Plaza.